With four more inches in depth added to the standard 12, the Elite 32” Storage Cabinet offers you even more storage potential for your laundry room, workshop or garage. 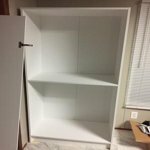 It has one fixed and two adjustable shelves, allowing you to fit a wide variety of items. Use it alone or add the optional 32” Stackable Wall Cabinet on top for a total of 89 vertical inches of storage. Best buy in a long time. I bought this two weeks ago and just love it. It's a perfect size for my small space and yet it holds loads of groceries. It's great value for the price. I wish I'd bought this long ago.Tip: The backing is visible to my guests so I switched it so that the white shows on the outside and brown inside. Love love love this cabinet! Easy to put together & perfect for what I needed it for in my office - perfect for the price!!! Hayneedle products are consistently above average in quality, speed of shipping, product description and price. This cabinet arrived days before expected arrival. Assembly only took 2 hours by 1 man. Holds a ton of stuff. I love my new kitchen cabinet. Get compliments on it from everyone that sees it. The door handles are especially modern and pretty. This cabinet could be used for anything you want to hide out of sight. I shop around for items I want to purchase & found exactly what I wanted at Hayneedle at a great price. Easy to put together...very neat looking. I bought 3 of these cabinets and they were of reasonable quality for the price. However, the building instructions needed another page of "tips" to avoid some of the problems I encountered, and they really need better quality control. One of the doors had industrial glue in a patch on the front. When I tried to remove, the white finish was gone in an area which exposed the particle board. I applied some white paint to hide the new defect -- but better quality control could have prevented this. After building the first one by myself, #2 and #3 were completed in about 2 hours each. But figuring out details which were not included in the instructions took a lot longer on the first one. Overall these were the right cabinets for our garage, but I would be a happier customer with better instructions and a door that did not need glue removal on the finish. Looks good, love the depth. Most of these pantries are 12-13" deep, but this one has those additional few inches that accommodate our larger pots and pans. We've only had it a few weeks, but it seems sturdy to hold our heaviest appliances (e.g. crock pot, food processor, etc. ), as well as two vintage, heavy pressure cookers. For the first time, we have plenty of room and can access everything easily. It wasn't difficult to assemble and we're quite pleased. I bought this cabinet to store extra linen. It was not that difficult to put together, the instructions were clear. The only problem I had was getting the doors to fit evenly. No matter which way I put them on they were not even and there is a gap between them. Since this cabinet is in the basement this is not a big deal. Other than that it is sturdy and good for extra storage. Sturdy, but just like everyone else is complaining about there is a significant gap. Like, almost a full inch of a gap that is not fixable. But then of course once you make it you don't want to unmake it and return it. So now I just have to bear with the fact that I can see what is in my cupboard. Handles missing from box and one side of unit had all of veneer peeled off at bottom. Predrilled holes were easy to assemble but Back is flimsy and cheap.